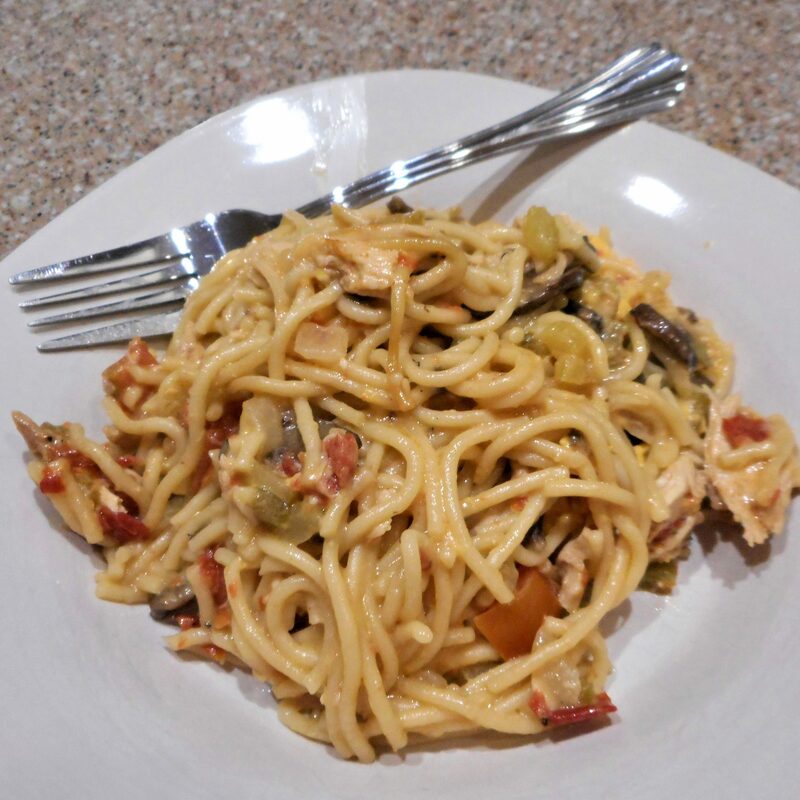 This creamy chicken casserole is another freezer friendly meal. Bake half tonight and freeze the other half for a rainy day. The recipe is also suited to an electric pressure cooker, directions included below. 1. Place the whole chicken in large pot or Dutch oven and cover with water. Bring to a boil, reduce heat, and simmer 40 to 60 minutes, until tender. Remove chicken from pot, reserving broth. Skin and bone chicken and set meat aside. 2. If using an electric pressure cooker: Stew the chicken with 1/2 cup of water until done. Skin and bone the chicken and set the meat aside. Return the skin and bones to the cooker and add 4 cups of water. Stew 15 – 30 minutes, depending on how much time you have. Strain the broth, discarding the skin and bones. Continue with the recipe. 4. Bring the chicken broth to a boil. Stir in pasta and cook 8 to 10 minutes, until al dente. Remove the pasta from pot and set aside, reserving the broth. 5. In a large skillet over medium heat, melt 4 Tbsp of the butter. Cook the celery, garlic, onion and bell pepper until tender. Remove to a very large bowl. Cook the mushrooms in the remaining 2 Tbsp of butter until tender and the liquid has cooked away. Add the mushrooms to the celery mixture. 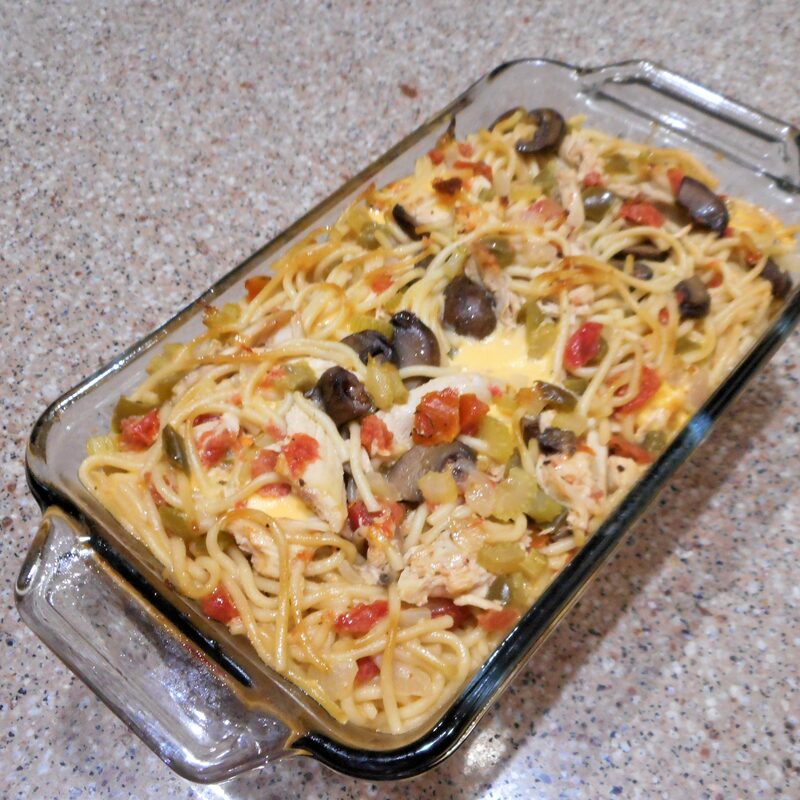 Toss the celery mixture with the pasta, diced tomatoes and green chiles, processed cheese, and chicken meat. 6. Transfer to a 9×13 inch baking dish. Pour one cup of the reserved chicken broth over to moisten. 7. Bake in preheated oven 20 minutes, until hot and bubbly.